Today was day 1 of GPUG Summit in Phoenix. Not much happened today… LOL… ya right! This year is the first year where there was content for the Power Platform (Microsoft Flow, PowerApps and Power BI). Today I took full advantage of that as it is predominantly new content for me and a chance to learn new things that aren’t necessarily Dynamics GP related. As I do with other events, I’ll go through what my day looked like. This was the only Dynamics GP session I attended although it had nothing to do with GP itself. Jonathan Cox was the presenter and he did a good job of walking through his experiences with Git and GitHub for source control. I’m interested in it because I want to get some of our SSRS reports into some source control, and be able to track changes I’ve made, versioning etc. on some relatively simple level. Saving versions of files in Windows Explorer doesn’t quite cut it as version control! The session times of the GPUG side and the PowerUG side didn’t align, and that gave me a 45 minute window where I could volunteer at the GPUG Medic’s desk. Microsoft staff are there all day + there are a couple or more volunteers from the community like myself who sign up to help users with their questions. “Free Support” is how we like to bill this one. A user came over right away and kept us busy with a bunch of questions. She did exactly what I recommend to others: she asked her users what issues they had, and brought emails, screenshots and details of the issues so we could attempt to help with what we could while we were there. They love it, we love it. Win-Win! This was the first of my day’s sessions on the PowerUG side of things. The presenter was fellow Canadian MVP Luc Labelle and it was a great session. I arrived a touch late, not factoring in properly the length of time to get from one end of the convention center to the other! All of the GP sessions are in the West building and the Power UG sessions are in the North building. Sitting through this session, thinking about wanting to pilot a Power BI rollout at work, it made me realize there was so much more to consider and plan out that I first thought. That’s a good thing I guess, and the point of attending a conference like this. The next session was presented by another fellow Canadian and fellow CPA-CGA, Chris Sorensen. I loved this one as this is an area I really want to dig into further at work myself. It was a ton of tips and tricks around how to create better data models to allow your users to easily create reports on their own with properly curated data sets. In my world, we are doing a lot of job cost reporting and there are so many different areas you could slice and dice on, it’s really important to build good data sets and data models to make more future reports possible. Getting the underlying data set right will go a long way to make more reporting options come true. This was a killer session! It was billed as a deep dive and instead of it being a 1 hour session like most, it was 2.25 hours! The original content it was based on was called “Admin in a Day” and they were attempting to cram it into 2.25 hours. LOL. The presenters were Kay Unroth from Microsoft and Phillip Guglielmi from Velosio. The content was great and the format was a mix of slides and demo with some Power BI Premium demo tenants available to us to try the features they were demo’ing, if we chose to try to follow along. Similar to my impressions of Session 2 with Luc Labelle, this gave me even more detail on all of the things to think about before deploying Power BI too far in the organization. There are certainly a ton of things to consider and configure in your Tenant Settings such as what sharing is allowed, what export options are allowed, and so on. I ended up leaving early because the GPUG General Session was starting right at the end time of this session (did I say the timing of the two UGs didn’t align well?). At the time I left they were barely past halfway through their content and I only left with 10 minutes to spare. I can’t imagine what they got through afterwards! I’ll look forward to the slide deck and hopefully they have notes in the slides I can get more details from! I should have grabbed a 2nd set of demo credentials to log into the tenant later (if it still worked) – part of the login process had us change the password and I didn’t write it down! Doh. The last session of the day was the general session for GPUG. All of the UG’s appeared to spread out their “general” session throughout the day as they all likely needed the big ballroom to fit in all of their attendees. The general sessions are typically similar between the UGs with news and information about the product, and awards presentations for the UG All-Stars. The GPUG session started off with a great group of GP partners presenting their favourite 2-3 items in Dynamics GP 2018 R2, which was just released earlier in October. It reminded me of last year in Nashville when I got the opportunity to be on the big stage myself doing the same thing. It was a lot of fun! Next Rod O’Connor and Jen Ranz were on stage showing off the Intelligent Cloud piece of GP 2018 R2, the newest of the new features. Amber Bell was on stage next talking about credentialing and the work we’re doing on the Dynamics Pro side with exam development. (I say “we” because I recently re-joined the organization as a member of the credentialing council overseeing both NAV and GP exam development). Next was the awards portion of the session. The gemstone award winners were recognized on Sunday night at a volunteer awards evening. Little did I know that I won a Ruby award. I don’t have it yet, since I wasn’t here on Sunday and I didn’t know I had received it until I saw my name on the slide! Go figure… I’ll find out more about this award once I get the details! There are 3 levels of awards for customers, 1 for partners based on community contributions over a 1 year period. The Ruby award is the “middle” of the awards for the customer side. Here’s a pic of the award itself, cool eh? I’m quite honoured as this is an award voted on by the community itself, and is a lifetime honour, which differs compared to the Microsoft MVP award which is decided upon by product teams at Microsoft only and is only for a 1 year period. That’s it for my night. I ended up back at my hotel, tired from a long day and hung out in the lobby restaurant writing this post, watching the MLB playoffs and unwinding! 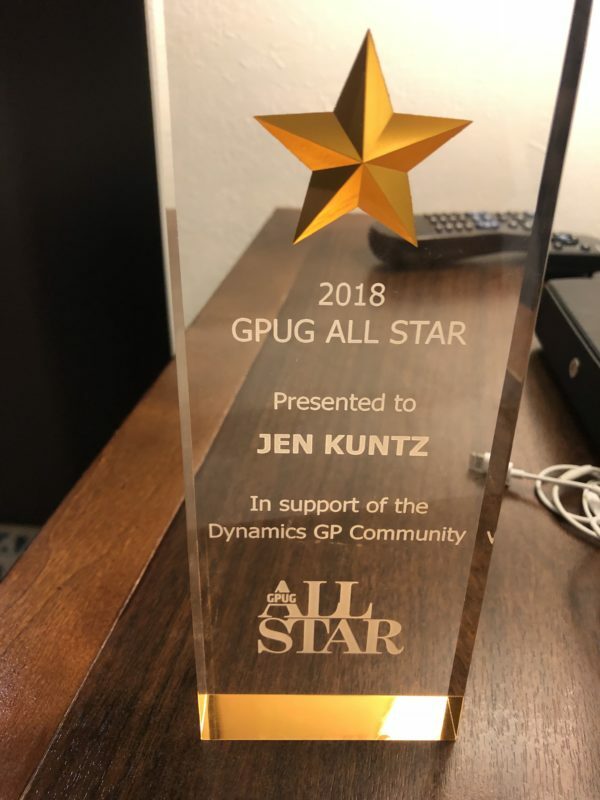 Congratulations Jen for the All-Stars award & the Ruby award.. well deserved! Congratulations on receiving the All Star award. You deserve it Jen.